The Quarantine interface can be accessed by clicking View Quarantine from the 'General Tasks' interface. The 'Quarantine' interface displays a list of items moved to Quarantine from the results of real-time scanning, on-demand scanning and manually. For details on adding executables identified as infected files during on-demand or real time scans to Quarantine, refer to General Tasks > Scan and Clean Your Computer. 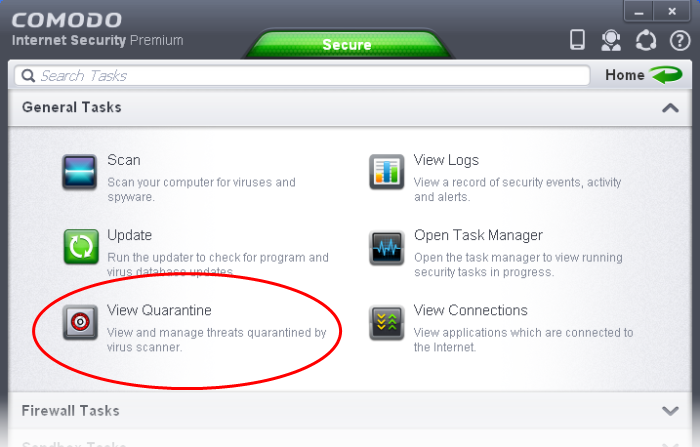 Navigate to the file you want to add to the quarantine and click 'Open'. The file will be added to Quarantine. You can even send the file for analysis to Comodo, for inclusion in the white list or black list, by clicking Submit from the options. Click the handle from the bottom of the interface and select 'Delete' option. Click the handle from the bottom of the interface and select 'Restore' option. An option will be provided to add the file(s) to Exclusions list and if 'Yes' is opted, these files will not be scanned again. The file will be restored to the original location from where it was moved to Quarantine. If the restored item does not contain a malware, it will operate as usual. But if it contains a malware, it will be detected as a threat immediately, if the Real-Time Scanning is enabled or during the next scan if it is not added to Exclusions list while restoring. Click the handle from the bottom of the interface and select 'Clear' option. All the quarantined items will be deleted from your system permanently. Click the handle from the bottom of the interface and select 'Submit' option. You can submit the files which you suspect to be a malware or the files which you consider as safe but identified as malware by Comodo Antivirus (False Positives). 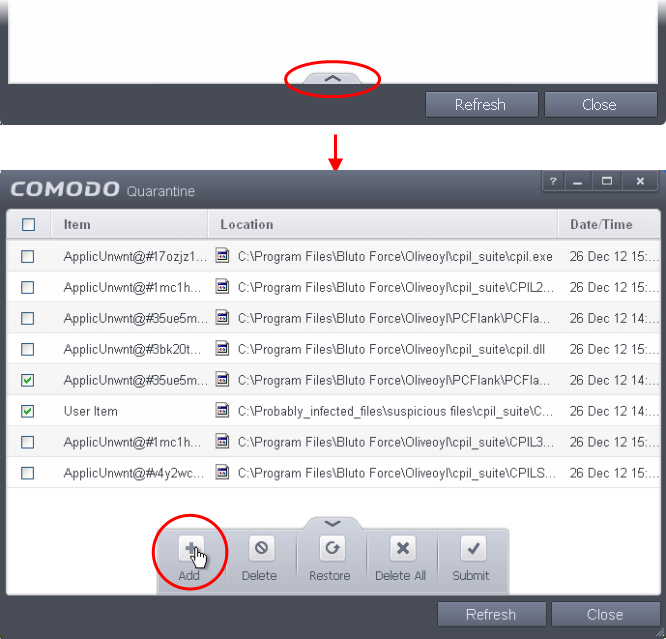 Comodo will analyze all submitted files. If they are found to be trustworthy, they will be added to the Comodo safe list (i.e. white-listed). Conversely, if they are found to be malicious then they will be added to the database of virus signatures (i.e. black-listed).